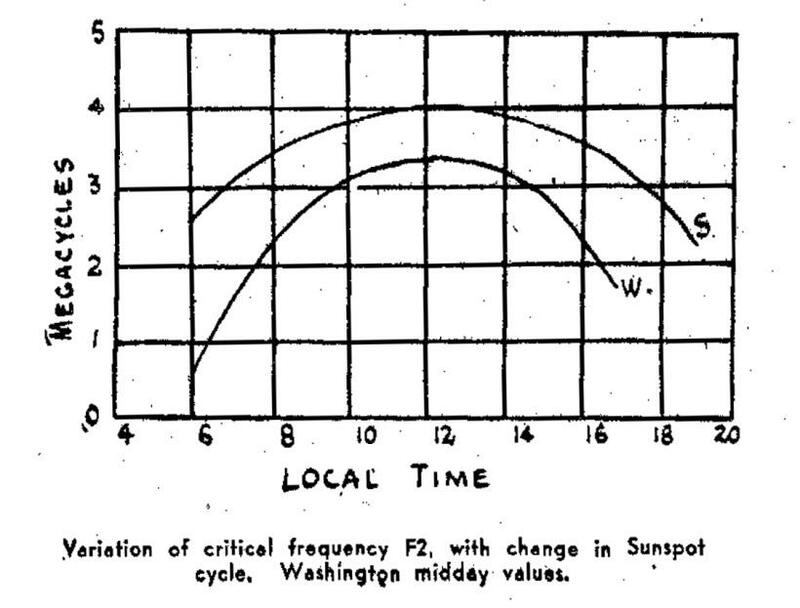 in fading and skip-distance transmission on various frequencies. By R. H. Healy, D.Sc., E. inst. 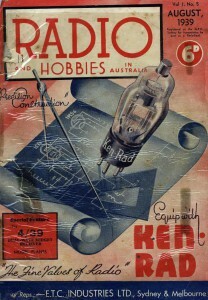 P.
SHORT-WAVE circuits operating between wave-lengths of 10 and 100m. (30 and 3 mcs.) are dependent, in the majority of cases, on reflections from the ionised regions or layers of the atmosphere. 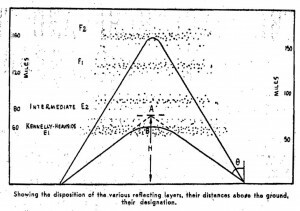 In the absence of these reflections, communications by means of the ground ray alone is only possible up to comparatively short distances, the actual distance depending on such factors as the earth resistivity, the wave-length, and the height of the transmitter and receiver above earth. The existence of such ionised regions was first suggested in 1902 by Heaviside, in England, and by Kennelly, in America. 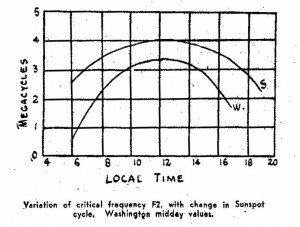 In 1918 Watson showed mathematically that a conducting shell around the earth would account for long-distance radio reception. It was not until 1925, however, that Appleton was able to demonstrate the existence of a layer about 100 km. above the earth. 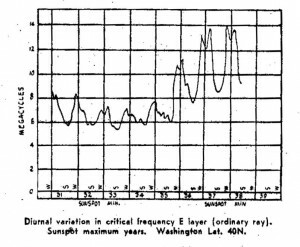 Shortly afterwards, during 1926 and 1927, he and his collaborators obtained, evidence of a further layer at a height between 250 and 500 km. There are three main reflecting regions In the ionosphere, the first at a mean height of approximately 110 km., known as the E-layer, the second at a mean height of about 200 km., ‘known as the F1-layer, and the third at a mean height of 300 km., known as the F2-layer. The height and density of these layers vary with time of the day, time of the year, sun-spot cycle and latitude, and these conditions in turn, decide which layers control the communications at various distances on various wavelengths. 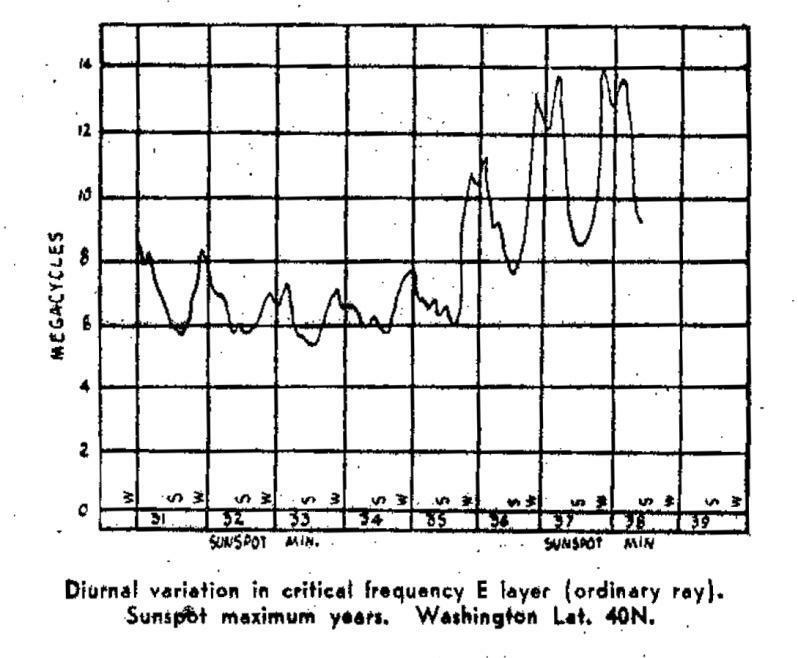 The Normal E Layer or Heaviside Kennelly Layer: The normal E layer appears to be produced by an ultra-violet radiation from the sun. This is indicated by the fact that the density increases with the latitude of the sun, reaching a maximum for the day at local noon. The density is also greater in summer than in winter, and no normal E-layer is found during winter in the Polar region. Normal E-ionisation at night is due to a residual of that produced during the day, reaching a minimum at daybreak of about 5 per cent of the maximum value. 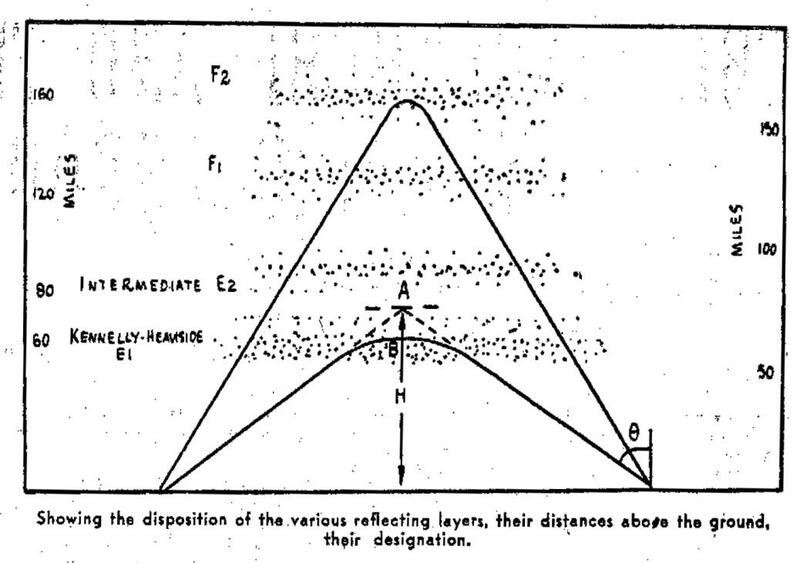 Abnormal E Reflections: Reflections are sometimes observed from the heights of 100 to 150 km., which are in some cases unconnected with ultra-violet radiation (E2-layer). The F1-layer: The F1-layer cannot always be observed as a separate layer. The ionisation of this layer seems to depend chiefly on ultra-violet radiation from the sun. The height of the F1-layer changes very little with the time of the year of the sun-spot cycle. The F2-layer, or Appleton Layer: The F2-layer does not appear to depend upon ultra-violet radiation alone, but also on some type of corpuscular radiation which can be present In the absence of direct sunlight. This Is Indicated by the presence of this layer during long nights in the Arctic region. The height of this layer may vary from about 200 km. In the winter to 400 km. in the summer. The increase in height during summer months is probably associated with the expansion of the atmosphere. d=2H tan θc where d is the Skip distance, H the height of the layer, Theta C the critical angle. 1. The time of the day. 2. The time o the year. 3. The sun-spot cycle (approx 11 years). In practice, the maximum value of w²c seems to be approximately 3wc. Systematic measurements have shown that wc for the f2-layer varied between 6 and 14 mcs. during the years 1931 and 1938. It follows that the maximum usable frequencies during these periods have varied between about 18 and 42 mc., (16.6 and 7.1m.). This conclusion appears to be in very good agreement with those reached by the Bureau of Standards (see report by Gilliland, Kirby, Smith, and Reymer, May, 1938). Moreover, it may be mentioned that the occasional reception of London television signals In America and in South Africa on the wave-length of 7m. indicates that at present this is close to the limiting value. It is important to note that at this low wave-length the skip distance is very great, having the value of about 3000 km. for 7m. It seems safe to say that reception on wave-lengths below 7m. will be very rare, corresponding to the short period abnormality of the E2-layer. It is, therefore, suggested that those of you who are interested In 5m. work should consider it as suitable, In general, only for short distance communications.